277,000 Tweets created on Twitter. 2,460,000 pieces of content shared on Facebook. 204,000,000 email message sent through various communication platforms. 4,000,000 search queries are made on Google. 216,000 photos are posted to Instagram. 3,472 images are pinned on Pinterest. 416,667 image/profile swipes are made on Tinder. These statistics just show how occupied users are with mobile applications and the Internet in general, and it does not look like things will be slowing down any time soon. 2.4 billion perople are connected online, representing a 14.3% increase since 2011. As more users become active online, we can only expect these figures to rise astronomically, representing a multitude of opportunities for marketing professionals to advertise via these various platforms. 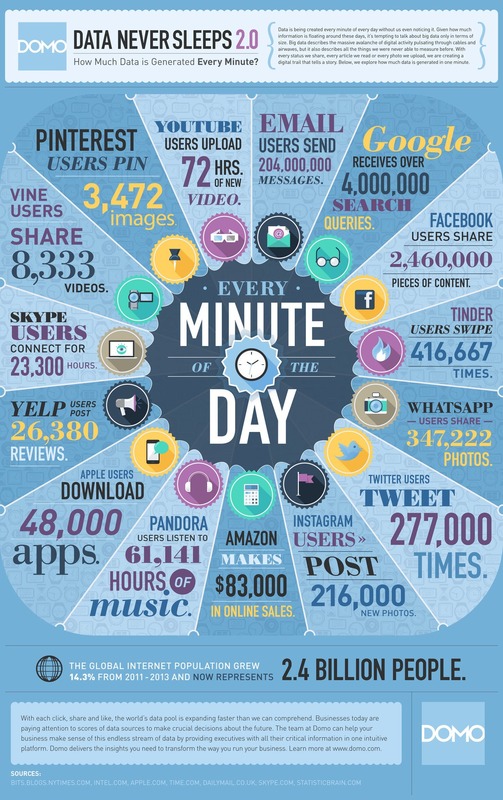 How active are you online within one minute?